Here is a picture she drew just for my Mommie! I think she is a pretty good artist, too. I received your wonderful letter as well as the stickers that you sent to me. Thank you very much for your letter and the stickers. I am attending 2nd grade and my favorite subject is mathematics. I live with my grandmother; her name is Marta. My mother she is staying in Chibuto village and my father is working in South Africa. Thank you very much indeed for letting me know that you received the drawing which I sent to you; I am so excited to hear that. My favorite food is rice and fish meat. The weather here is very hot. We are in summer season. I will write to you next time. My best regards to you. With love, Mequelina. Daisy....you live with such a wonderfurrr mombean! Take good care of furr. Now as a pink lady member, I have to let you know our Suzanne (my sister) is not feeling well today. Please give her a soft purrrr, she doesn't have any right now. I bin 2 C her twice and told our Daddy about it too. I love your peace globe, especially the daisy and your pawprints. I think it's wonderful that you are sponsoring a child. Peace and love to you and Pixie and your beans. Your globe is very sweet! Peace to you and Pixie and your Mommy and Daddy! Peace and purrs to you and yours, Daisy and Pixie!! What a wonderful thing your mom does, sponsoring a child! I enjoyed reading Mequelina's letter. I like your peace globe, Daisy and Pixie. :) Peace to you both. 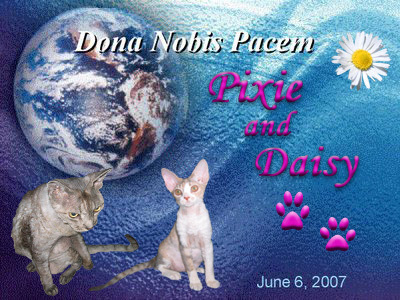 Happy Peace Day Pixie and Daisy! peace to you daisy and pixie too! and your little girl mequeina too! your globe is furry beautiful! 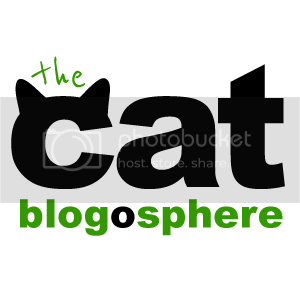 This was a very nice blog today. Mequelina is a doll. We are so happpy that you are sponsoring her! That is so wonderful! How great that your sponsor her and send her neat little gifts. It has probably been fun watching Mequelina grow up thru pictures she sends! We liked her drawing. Peace to you and your family, Daisy. That is very sweet Daisy & peace to you & your family! That is wonderful about Mequelina. I, too, believe love conquers all things. Daisy, it is super great that your mommie sponsors that child. We love your peace globe! 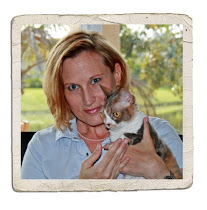 Peace to you, Pixie and all your family! That little girl looks very sweet and petite...just like you Daisy! You are right: the girl IS beautyful! I loved her right away! Mequelina is ADORABLE! The picture is very lovely, too. Her letter to your mommy is very nice, it made my mammacat's eyes leak a litte bit. Your globe picture is very creative! Ghandi said that poverty was the greatest form of violence. What a lovely thought to include her today. 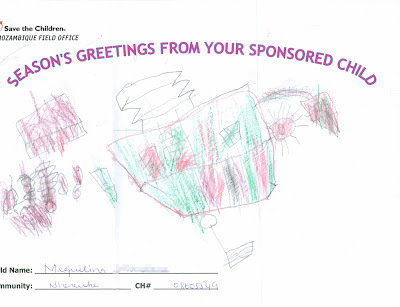 It is lovely that you sponsor Mequelina. Your globe is beautiful. Peace to you all. Your mommie is such a thoughtful, caring mommie. We really like your globe, too. You did a great job. Mequelina is pretty and talented and she is smart too! That is so so sweet. Great globes and great post. Peace to you all. Daisy & Pixie: you did a great job on your peace globe! and Mequelina's eyes are so beautiful! you all do such wonderful things in your family! what a lovely bean-sisfur you has--her eyes are as pretty as kitty eyes!! it is furry nice of your fambly to help her! nice peace globe--love your pictures & the daisy! What a lovely peace globe. And how wonderful that you and your family are sponsoring beautiful little Mequilina. Love and purrs and peace! Peace to you and yours, Daisy! What a wonderful thing your mom is doing! whatta bee-yootiful peace globe, and that's such a great thing, you and yer family sponsoring the bee-yootiful little girl. Peace and love and purrs from MaoMao! Peace to you Daisy, Pixie and yer mommie. 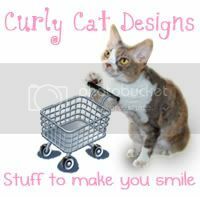 Yer mommie is furry speshal for sponsoring the very purrrty little girrl Mequilina. You could give her a nose kiss if you effur meet. We all hope Mequilina and her family have peace in der lives too. Beautiful Peace Globe, you and Pixie look cute. Such a nice Mom and family to sponsor Mequelina. It's cool that you can communicate with her. Her drawing was wonderful. Peace to you and your family. Daisy, I reely injoyd reeding abowt Mequelina. She sownded neet. It's kinda like sponsering a Best Frends cat, ixsept it's a littul persun! I think I'll see if I can sponser a littul persun of my own, cuz I love to git male. u an yer mom ar grate individyooalz. Your peace globe is mighty wonderful! And tell your Mommie that we think she is a really cool human! To sponsor a child in Africa, that is so cool. We hope she will also sponsor some cat somewhere? Hi there, thanks for your comment, and peace to you as well. Thanks for introducing us to Mequelina; she has such beautiful and expressive brown eyes. Your peace globe is fabulous--and you even have a daisy. That is a great peace globe! And that is so wonderful that your Mom sponsors a yong bean! What gorgeous brown eyes she has! I really like your globe, Daisy and Pixie. That is great that you sponsor a little girl in Africa. 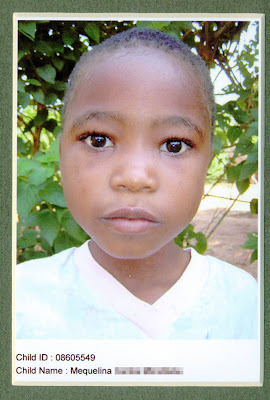 We also sponsor some children, one is in Tanzania and one in Dominican Republic. Peace to you, Pixie, your mommy, Mequelina, and the whole world, Daisy! Our mommy and daddy sponsor a child named Joel from the Dominican Republic. They never sent him stickers though - what a great idea! daisy and pixie, you have a beautiful peace globe! mama's going to sing your special song to me tonight. i ate a little bit of baby food...and it was really good! i'm kind of tired, so i'm going to let mama take me to bed. thank you being such a good friend! Daisy that is very wonderful! We're so proud of the help that your family is providing that darling girl. Peace to you and yours, now and always! Your Peace Globe is really pretty. Your sponser child is a sweetheart. She's really cute and I liked the picture she drew for you and your Mom. Sponsering a child is the best way to celebrate Peace. God Bless. What a stunning child and a stunning effort for peace.